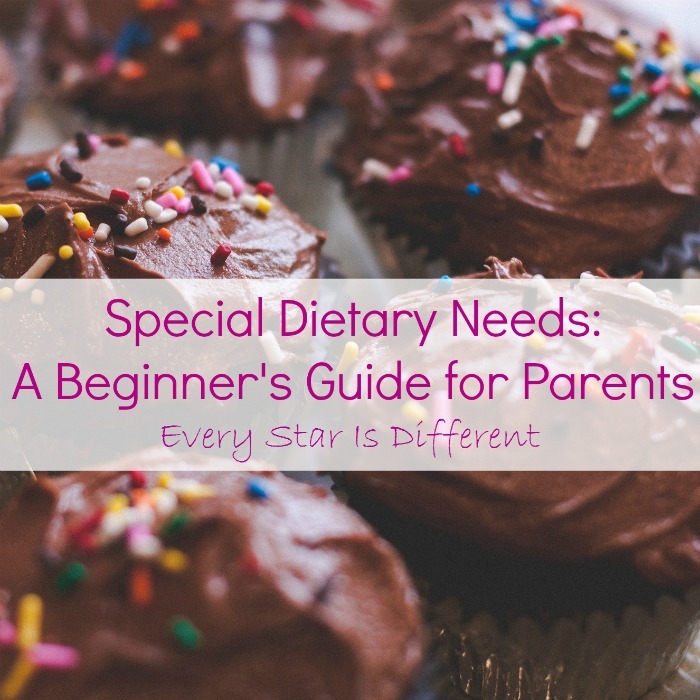 There comes a point in time when a parent realizes that their child with special needs isn't just going through a picky eating phase, but in fact struggles with mealtime. 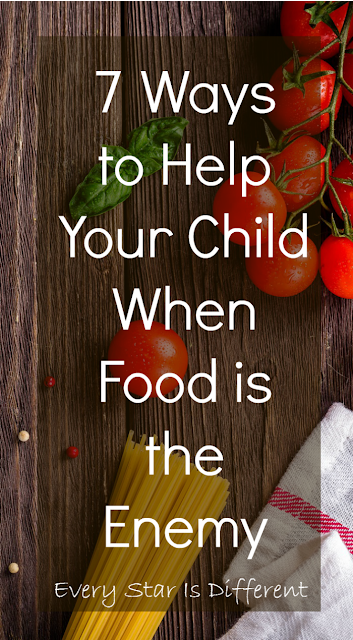 It may take years to figure this out, but once it's realized, a parent is desperate to find ways to help their child develop a better relationship with food. 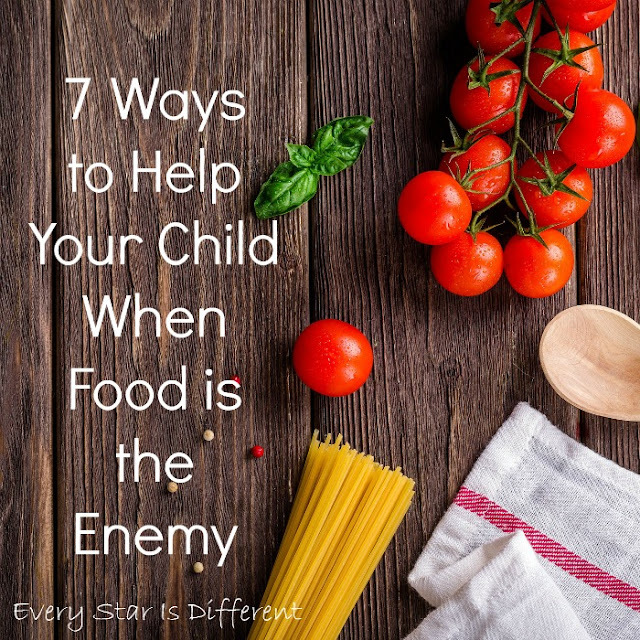 This post includes our family's story with food and 7 ways to help your child when food is the enemy. We have used these methods for years and can attest that our efforts have not been wasted. The results have been magnificent! Food has always been an enemy in this house. Dinomite has never liked it. He refused to nurse at one week old. As a young toddler we'd hide food in his toys, in hopes that he would find the pieces and "accidentally" put them in his mouth. There came a time when our pediatrician said if things didn't change, drastic measures would need to be taken. Thankfully Dinomite continued to gain just enough so that wouldn't happen, If there was a pill that one could take, instead of eating food, he'd do it. 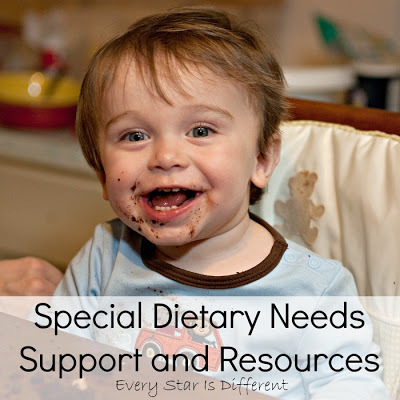 Challenges with food are part of Dinomite's autism. Bulldozer's story is just plain crazy. 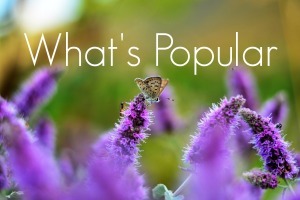 How many children do you know who are born allergic to over 40 foods? You can read more details about our adventures HERE. Then, add autism sensory issues to the mix. Meal time is HARD. Food is definitely the enemy. Princess' story is one of trauma and neglect. When she arrived at 6 months, she didn't know how to eat. You would hold a spoon out and she would avoid the exercise of eating at all costs. I used to think it was because she was clueless, but experiences have led me to believe that there was also a fear factor. Princess has definitely been known to refuse food for long periods of time. I can attest, the situation definitely feels like a battleground. Sunshine has everyone's issues combined. She has food allergies (which you can read about HERE), autism sensory issues, and a past that involves trauma and neglect. I must not forget her need to over stuff. Sometimes this leads to gagging and vomiting. Oh how I wish food weren't the enemy! Over the years I have had to figure out ways to work through mealtimes, making sure meals are safe, healthy and include foods my kids will eat. I won't lie, this has been VERY challenging. One thing I have learned more than anything else is that forcefulness only brings about tears and usually vomit. So what has worked? 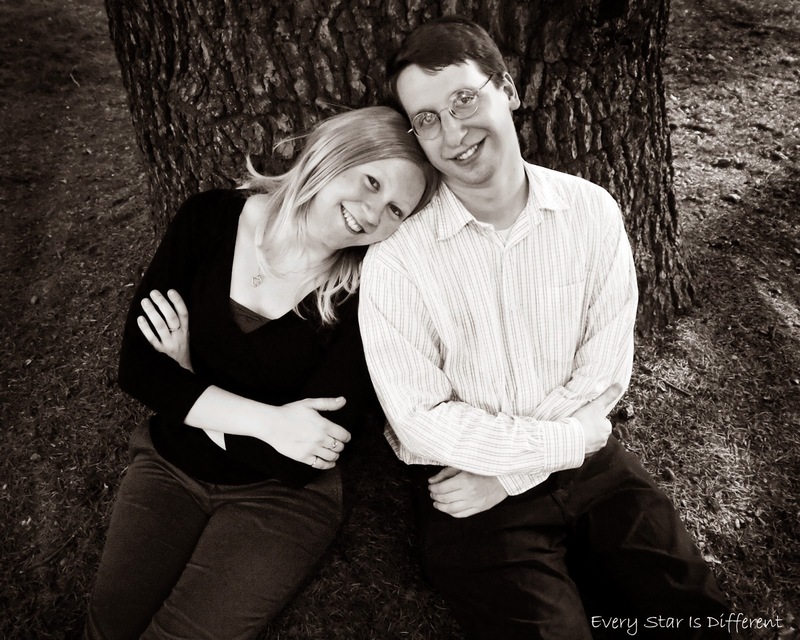 This can be challenging at times, but it has yielded so many rewards for our family. Usually I only take one at a time. Each child has other sensory issues they're trying to work through in a grocery store, so having more than one with me is a little much. When Dinomite was in a summer preschool day camp, he had to bring his lunch everyday. I was mortified because I had no idea what I was going to pack. His diet was so limited. Each week we went to the grocery store together and I told him he had to pick out something new. I didn't care if it was healthy or junk food, but it had to be something he had never tried before. He LOVED this exercise. Usually the item was a variation of something he already liked, but for a child who refused to eat chicken nuggets ever again because the packaging on the front of the box changed, this was progress. Bulldozer loves to grocery shop. 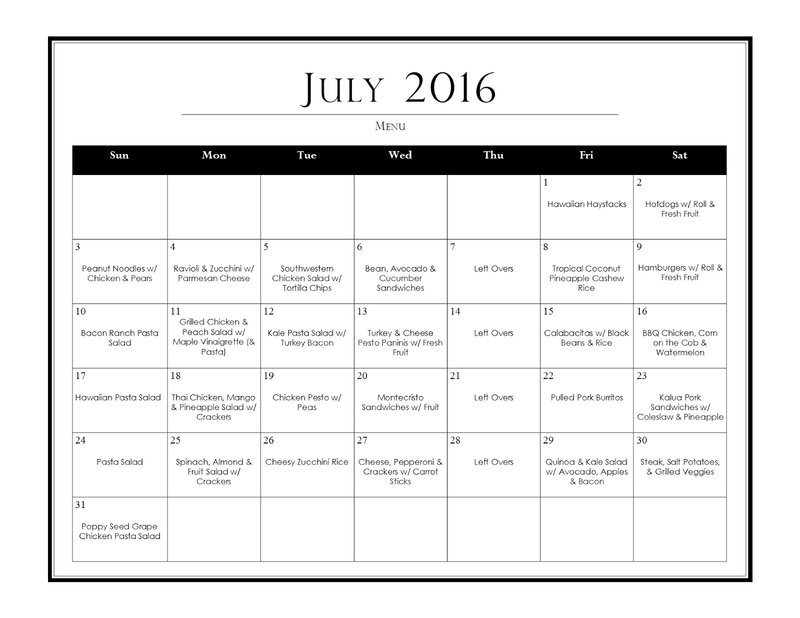 His favorite day to go is Saturday because Wegman's has stations set up all around the store with free samples. Never in a million years would this child try new foods at home, but because we're at the store and it's the "cool" thing to do, he loves the ritual. This has expanded his diet in so many ways. 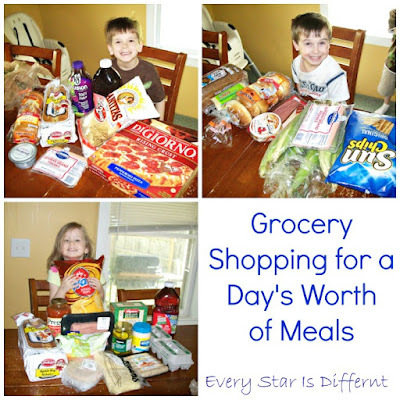 Once the kiddos were able to master going along for grocery shopping trips, they started doing some shopping of their own (with parent supervision of course). They would each be in charge of selecting a day's worth of food for our family to eat each week. I'm not sure who enjoyed this more out of the three older kiddos. There were so many benefits. It gave the kiddos such a sense of pride to know that everyone would eat something they selected and that they could choose what they wanted. You can tell from the pictures below that they all have very different tastes. This has been crucial to maximizing success at mealtimes. Before grocery shopping, we sit down at the table and plan the menu for the week together. We have a Meal Planner dry erase board that I fill out as we go. Each person in the house selects one breakfast, lunch, and dinner, as well as one fruit and one vegetable for snacks. No choice can be repeated by another person. This has worked very well for us, after the kiddos became comfortable with the grocery store, and didn't need the visuals to help them make their food choices. Over time we developed a 30 day meal plan calendar without a single meal being repeated in the cycle. This was HUGE as it provides such a variety of foods everyone can enjoy. Let me be clear, this doesn't mean that everyone eats everything on this menu. There are MANY nights when Dinomite eats a PB&J sandwich instead. The key thing is that he's willing to sit at the table and eat with us in close quarters. At least two times a week he will eat part of a meal served. The magical component that makes this menu work is that the ingredients for each meal are prepared separately, and then combined to create the final product. So, if someone can't handle food mixed, we make their plate before combining ingredients. If someone can't have one or more ingredients because of food allergies, we make their plate before the last ingredient is added or let others add the ingredient on their individual plates. If a child will only eat one part of the meal, and not the others, they can. I'm no longer making 3 different meals, and everyone is happy. Once we were able to create one 30 day meal plan, we worked on creating two, one for Autumn and Winter, the other for Spring and Summer. I'm not going to mislead you into thinking this was easy. This process has taken YEARS, and has only been successful with the kiddos' 100% involvement. 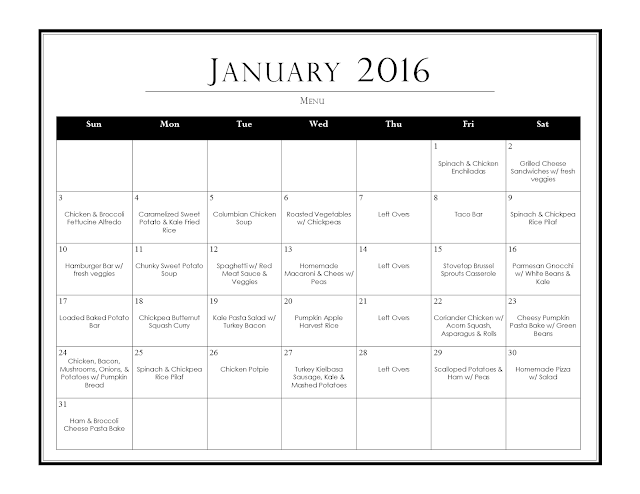 If you'd like to see our meal plans up close and print a copy for your own personal use, you can obtain your free copy HERE. Recipes for all meals can be found on my Dinner Ideas and Recipes Pinterest Board. Now that we've conquered the dinner menus, we're moving on to breakfast and lunch. The kiddos have decided on their own that they don't like eating the same things each day, because they know just how many choices are out there. Sunshine and I just spent time bonding yesterday while seraching Pinterest for lunch ideas she can enjoy. This special table can make all the difference in the world at mealtime, especially for children with sensory sensitivities. I only wish I had known about it sooner. 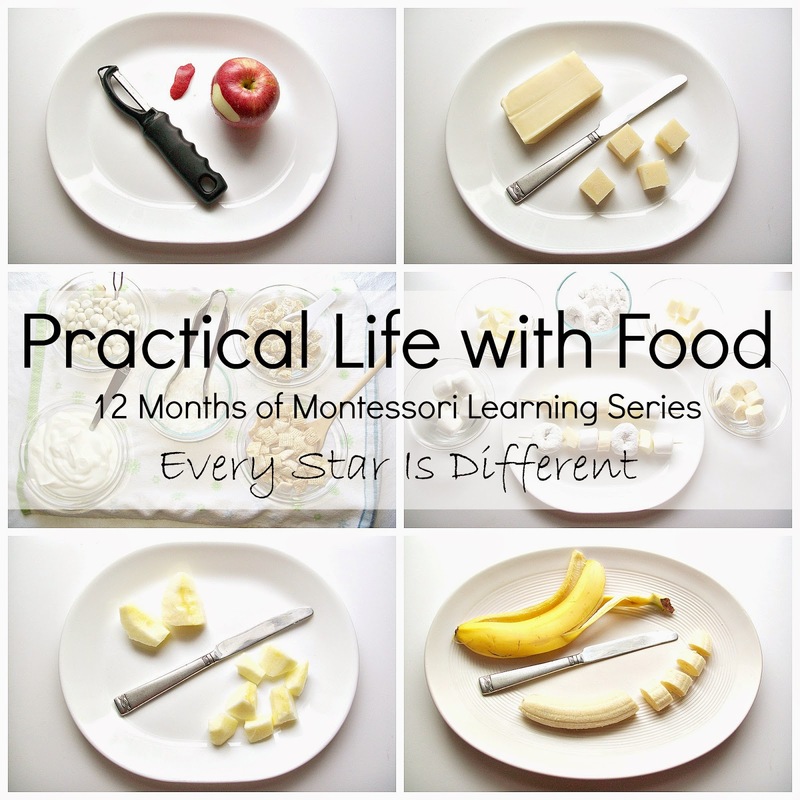 For more information about the weaning table be sure to check out these posts: Benefits of a Montessori Weaning Table from The Kavanaugh Report and Preparing Montessori Toddler Spaces from Living Montessori Now. Sunshine has a weaning table and uses it at every meal. This helps her focus on her food and eat it correctly. She feels in complete control of her surroundings and can be independent which is something she needs. 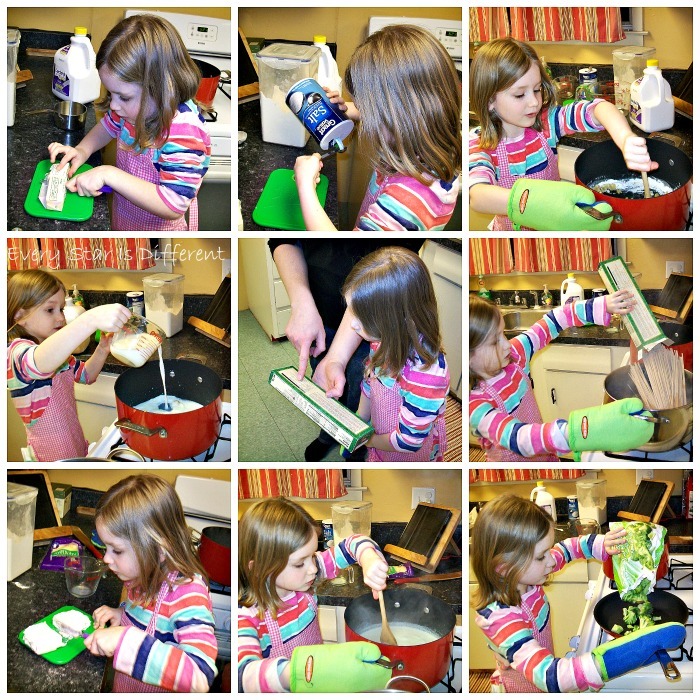 We have worked very hard to create an environment of self care and independence in the kitchen. This has resulted in a feeling of safety and comfort, which has then lead to more positive mealtime experiences. For more information about how we created a more kid friendly kitchen atmosphere that invited multiple practical life experiences, read the post below. Cooking has always been something we've done with our children, but this year we stepped up our game and all of them are now preparing full meals with us. Most often it's the meal they've picked on our weekly menu. We've found that as the kiddos actually touch and prepare the meals they're more apt to try a bite. Dinomite has taught us that it's not just taste that turns him away, most often it's the look, the sound, and sometimes the feel of the food. 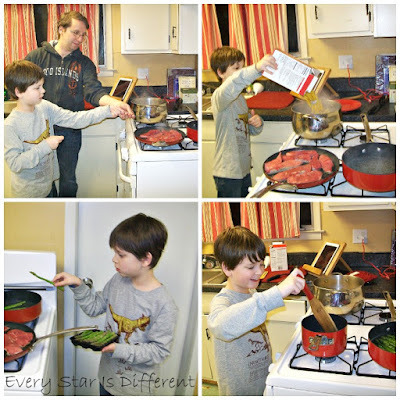 Bulldozer loves cooking and baking more than any other child in the house. He craves visual stimuli. 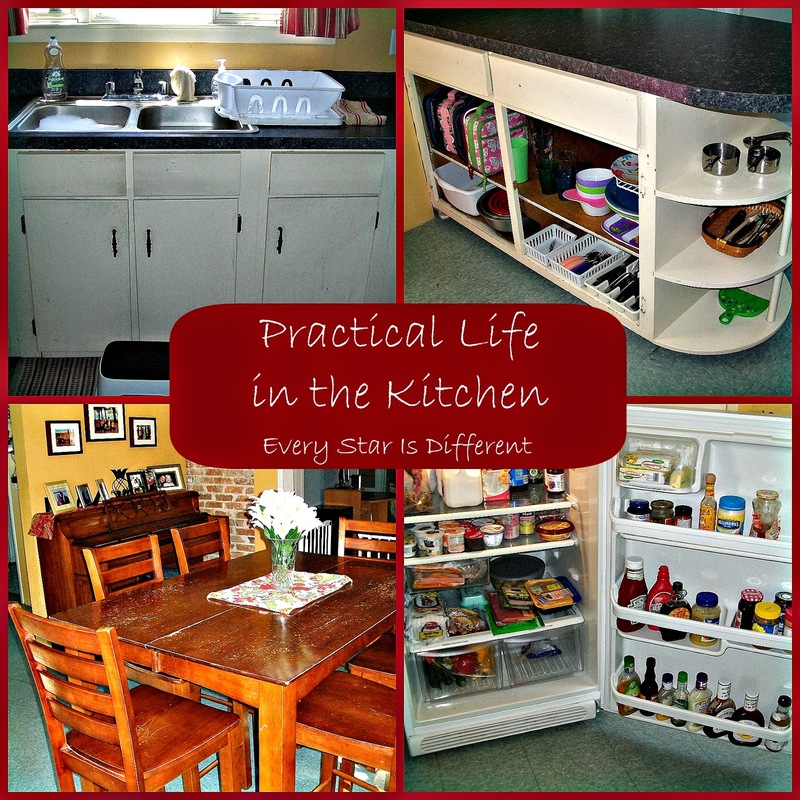 Cooking and baking provide some great opportunities to meet that constant need. When he prepares a meal he goes all out, as seen in the photos below. The night these photos were taken he made homemade bread, chocolate chip cookies, spaghetti with red sauce and meat, and a salad for everyone. Princess enjoys cooking almost as much, but is still very anxious about it. 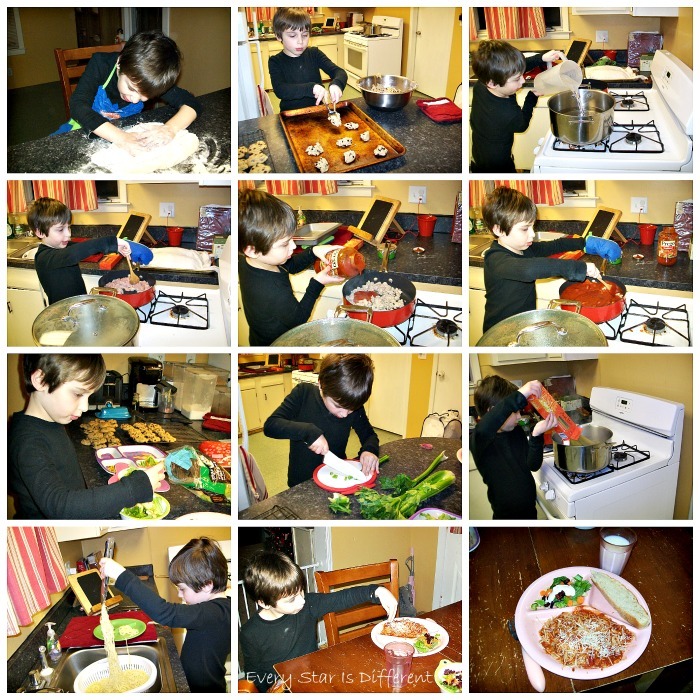 The night these photos were taken, she was making chicken and broccoli fettuccine alfredo. Dinomite struggles with cooking because he's working with food. Usually he won't bake, but when we give him free reign of the stove he perks right up, deciding to make steak, asparagus, and pasta for dinner. Have I mentioned Dinomite HATES pasta? For the longest time he wouldn't even sit at the table with us if we were eating it. And now... He still won't eat it, but he'll prepare it and sit right next to someone else eating it. Cooking has helped him with this. 6. 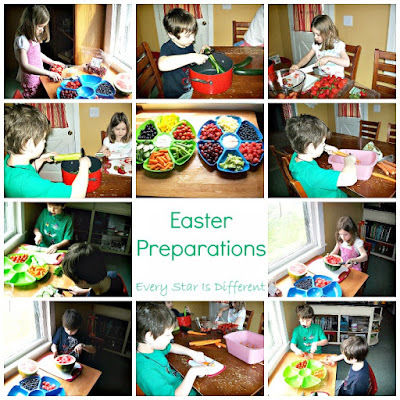 Plan and prepare celebrations that include "feasts"
Planning for celebrations is a task my children look forward to. And by plan, I mean they all have a say in what we eat. Usually we'll all agree on a main dish, and then each person in the family will choose a side. The four kiddos also request a dessert each. The kiddos are researching foods and reading through recipes. They search Pinterest, using the visuals provided. They're willing to try new foods. Every party with a feast has been a success. As we prepare the foods, they're definitely getting their hands dirty. Before every big event we take a couple days off from our usual routines and spend all of our time in the kitchen. They LOVE this and always ask for more. Even Dinomite is prepared to work. All of the kiddos have come so far! Some celebrations only include sweet treats but others include healthy meals. For examples and ideas about kid friendly celebrations and "feasts," feel free to check out the posts below. Sensorial activities have been crucial to Dinomite's success in the eating department. When you take him away from mealtime and from the dining room table, it's as if part of the threat that's usually there, is gone. 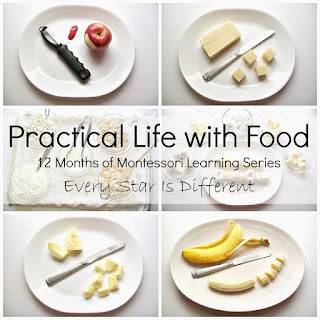 In our Montessori-inspired Fruit Unit w/ Free Printables he touched and sampled every fruit we worked with. It was amazing! Though he didn't find many options he enjoyed, he at least tried them on his own. Overall, we've found that the more the kiddos participate in all food related events without pressure, the more likely they are, over time, to decide they want to try something new. Since they've all participated in every aspect of a meal, the need to meltdown and/or act out has lessened. I'm starting to believe that food isn't as much of an enemy as it used to be! I really get stressed when the kids won't eat LOL Basically I learned how to let go and take it easy. of it. Also explaining the health benefits and keeping tasty and hot makes to get the attraction of children. And thanks Renae for your very helpful tips. Thanks for featuring Mama's Happy Hive! I thought my little boy was a picky eater. You are amazing with how you have brainstormed and put together a menu that works for everyone. Some fantastic ideas here Renae. I need to get my kids more involved in the kitchen - thanks for sharing your inspiration! Renae, you are easy the most organised person I have ever met! Keep up your incredible work! Miracles do happen! I hope your children will grow out of some of these allergies! Wow, that sounds like quite a battle ground. I laughed at hiding the food in toys in the hopes they would eat it. My kids hide food in their toys and if I don't find it they will eat it days or weeks later yuck. I've never heard of a Montessori weaning table. 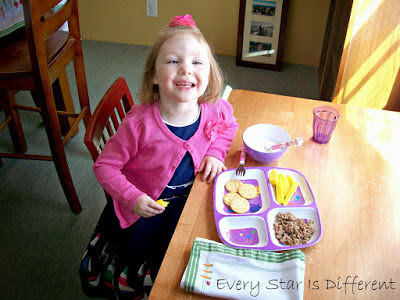 We did baby led weaning and found that worked for our kids though. I agree having my kids help cook and bake is the best way to get them involved and hopefully eat it. I shall be following these points as my son is not keen on food either. I have pinned this to the #ToddlerFunFriday board.